Over at BladeHQ, they kicked off some early Black Friday 2018 deals. The sale prices are said to be valid until 11/26/2018. 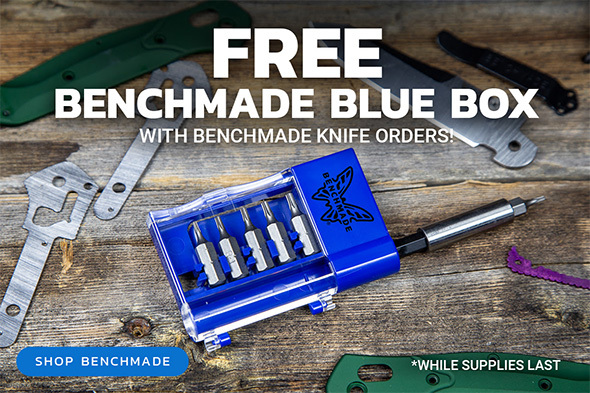 Buy any Benchmade knife, get a free “Benchmade Blue Box” tool kit. I’m a fan of Benchmade’s USA-made knives, particularly the G-10 mini Griptilian, reviewed here. Before that, the previous generation of mini Griptilian was also a personal favorite. 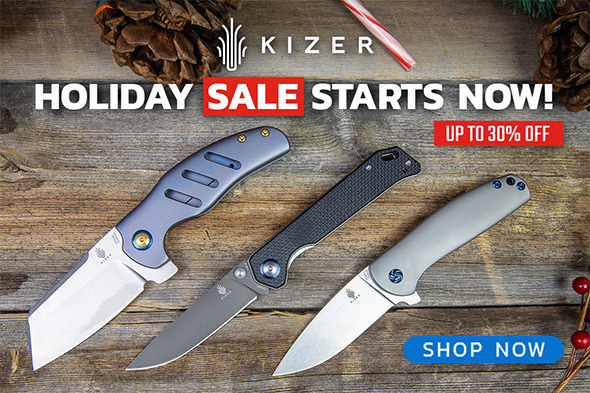 ALL Kizer knives are on sale. Kizer is a Chinese knife manufacturer that, like some others, makes use of premium blade steels and handle materials. I bought 3 Kizer models in recent years, 2 under $75, and 1 at around $150, and the quality has been very good, even impressive. Their higher-priced offerings are better, but their more affordable knives are decent, even competitive against similarly-priced USA-made knives. They’ll be included in my next series of knife reviews. BladeHQ’s newsletter spotlights the Begleiter, which caught my attention with its low price. I own a different Kizer Vanguard-series knife, and it doesn’t have the same fit and finish as the Gemini, below, but it offers similar style at a lower price. My Vanguard definitely doesn’t have the more premium feel to it, but it’s good for what I paid. The Begleiter is made using less premium handle materials, and less premium blade steel, hence the significantly lower price. 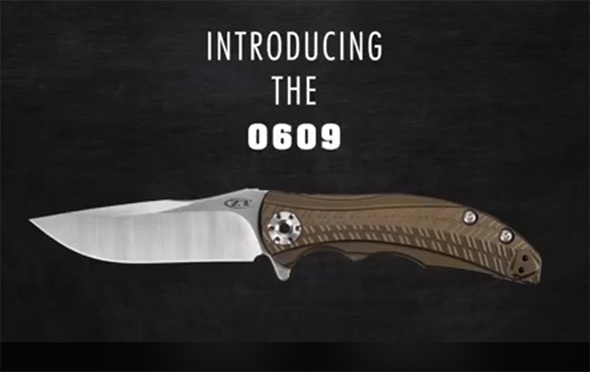 It has a 3.5″ blade made from VG-10, and stainless steel liner lock with G-10 handle scales. The Kizer Gemini – one of the knives I bought for review – is a very “clean” knife, if that makes sense. It’s a Laconico collaboration, with smooth titanium framelock handle and 3.125″ stonewashed CPM-S35VN blade. It’s a great flipper-style knife, and I like that it lacks the “tactical” aesthetics that are [too] popular these days. It’s on sale for $145, and there are some higher-priced dressed-up versions also on sale. Like Kizer, We Knives is a Chinese-based knife manufacturer, and a darned good one too. We Knives tend to be a little more stylish, which can be good or bad, but their overall quality is good, and their increasingly growing selection means there’s something for everyone. Their knives are higher priced, starting at around $90. If you want a We Knives knife but your budget is under $100, wait for the next MassDrop Gent knife “drop”, which was last priced at $80. There’s also a sale on 3 discontinued models – 0055, 0920, and 0850. Zero Tolerance makes great-quality knives, in the USA. They’re typically designed for harder use, and hold up well in all kinds of environments.